One of the recommendations of running SQL Server instances on Azure virtual machines is to ensure that default paths and directory setup is changed once the gallery image has been deployed. If you are performing a custom install of your SQL Server instance and not using an Azure Gallery Image, then you would want to instruct the setup program to install the system databases and the log directory in a separate folder other than the operating system drive or the temporary drive. If you have used a virtual machine gallery image, then you will have a default instance of SQL Server with the binaries and system database files on the C: drive. I had earlier blogged about how to find out the startup parameters using a WMI class and VBScript. I just use PowerShell to make the WMI query. Yes, even I have learnt a few new tricks over the years! The PowerShell script below would let you check if the startup parameters which contains the location of the SQL Server Errorlog, the master data file and the master log file are placed on the OS drive. If yes, then it will report that you are doing something that we do not recommend! Time to change the files and the ERRORLOG to a data disk. $Params = gwmi -Namespace root\Microsoft\SqlServer\ComputerManagement12 -Class SqlServiceAdvancedProperty  -Filter "SqlServiceType = 1 and PropertyName = 'STARTUPPARAMETERS' and ServiceName = 'MSSQLSERVER"
$Params = gwmi -Namespace root\Microsoft\SqlServer\ComputerManagement11 -Class SqlServiceAdvancedProperty -Filter "SqlServiceType = 1 and PropertyName = 'STARTUPPARAMETERS' and ServiceName ='MSSQLSERVER'"
$Params = gwmi -Namespace root\Microsoft\SqlServer\ComputerManagement10 -Class SqlServiceAdvancedProperty -Filter "SqlServiceType = 1 and PropertyName = 'STARTUPPARAMETERS' and ServiceName ='MSSQLSERVER'"
# Run a foreach loop to check if the boot drive is present in the startup parameters. If yes, report the same. * This blog post has been written based on the service details available on 23rd November, 2014. In the last post of this series, I had described how to determine if any database files were hosted on the temporary drive on the Azure virtual machine. In this post, I shall check if any of the drives hosting the SQL Server database files have block sizes other than 64KB. As per best practice recommendations for SQL Server workloads running on Azure virtual machines, it is recommended that you use a 64-KB allocation unit size for data and log files as well as tempdb. In the first part, I will be talking about how to determine if the block size for the drives hosting the database files is 64KB or not. The first thing that needs to be done is to retrieve the volume details using the Win32_Volume class and use the BlockSize value to determine the block size of the volume. To avoid false positives, you will also need the disks on which the SQL Server database files are hosted on. This can be retrieved using the sys.master_files system catalog. Using both the sets of information, you can determine if any volume that is hosting a SQL Server database file has a block size other than 64KB. The PowerShell script that I had used is available below. This script also makes use of PowerShell snippet that I had used to identify the temporary drive which I had blogged about last week. This is quite a common recommendation and has been taught to DBAs when they were in DBA elementary school! But sometimes, these recommendations are not followed for various reasons… some known and some unknown. So I decided that while I was at it, I would write up a quick PowerShell script to determine if the data and log files are present in the same drive using information retrieved from the sys.master_files catalog view. 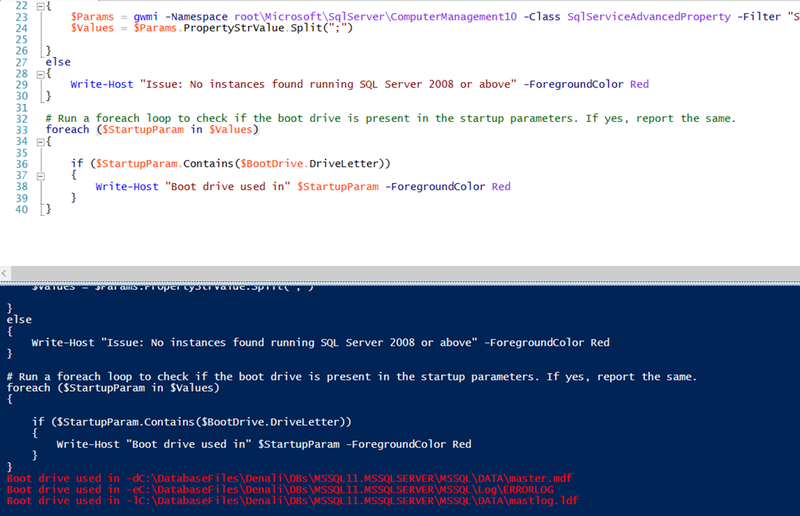 The PowerShell script is give below along with a screenshot of the output. $sqldisks = Invoke-Sqlcmd -ServerInstance "." -Database "master" -Query "select distinct substring(physical_name,0,4) as disk, type_desc from sys.master_files"
* This blog post has been written based on the service details available on 16th November, 2014. In this post, we will start checking if the SQL Server files are following best practices for Azure storage recommendations. In Part 4 of this series, I had written about how to identify the temporary drive on an Azure Virtual Machine. I am going to use that snippet of code to perform the file layout test that I will perform here. 2. The script first finds out if the Azure Virtual Machine is a D-series machine or not. 3. Then it fetches the file location from the SQL Server instance using the Invoke-Sqlcmd cmdlet. 4. Using the above information, it determines if files are present on the temporary drive or not. If this is a D-Series virtual machine, then the script will not report a warning if it finds the tempdb files on the temporary drive as it is supported. For any other series, the script will report an issue since database files residing on the temporary drive are not supported on the temporary drive other than the D-Series. $Antecedent = "*" + $Name.Name.Replace("\","").Replace(". ","") + "*"
$Antecedent = "*" + $Dependent.Dependent.Split("`"") + "*"
$dbfiles = Invoke-Sqlcmd -ServerInstance "." -Database "master" -Query "select physical_name, name, db_name(database_id) as dbname, type_desc from sys.master_files"
Please keep in mind that the above script has not been tested for mount points. * This blog post has been written based on the service details available on 10th November, 2014.